The legend of St. Cecilia has become very popular. She is best known as the patron saint of music. 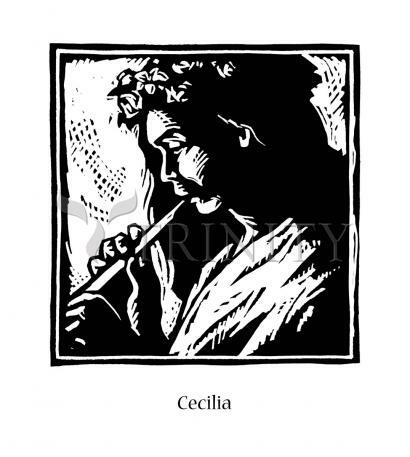 This attribution stems from the story that Cecilia, forced by her father to marry, heard heavenly music within her heart on her wedding day, inspiring her to remain faithful to her vow of virginity. After converting her husband Valerian to Christianity, they both soon died as martyrs for their faith at the hands of the Romans. The story of S. Cecilia is not without beauty and merit. There was in the city of Rome a virgin named Cecilia, who was given in marriage to a youth named Valerian. She wore sackcloth next to her skin, and fasted, and invoked the saints and angels and virgins, beseeching them to guard her virginity. And she said to her husband, "I will tell you a secret if you will swear not to reveal it to anyone." And when he swore, she added, "There is an angel who watches me, and wards off from me any who would touch me." He said, "Dearest, if this be true, show me the angel." "That can only be if you will believe in one God, and be baptized." She sent him to Pope S. Urban (223-230), who baptized him; and when he returned, he saw Cecilia praying in her chamber, and an angel by her with flaming wings, holding two crowns of roses and lilies, which he placed on their heads, and then vanished. Shortly after, Tibertius, the brother of Valerian, entered, and wondered at the fragrance and beauty of the flowers at that season of the year. When he heard the story of how they had obtained these crowns, he also consented to be baptized. After their baptism the two brothers devoted themselves to burying the martyrs slain daily by the prefect of the city, Turcius Almachius. [There was no prefect of that name.] They were arrested and brought before the prefect, and when they refused to sacrifice to the gods were executed with the sword. In the meantime, S. Cecilia, by preaching had converted four hundred persons, whom Pope Urban forthwith baptized. Then Cecilia was arrested, and condemned to be suffocated in the baths. She was shut in for a night and a day, and the fires were heaped up, and made to glow and roar their utmost, but Cecilia did not even break out into perspiration through the heat. When Almachius heard this he sent an executioner to cut off her head in the bath. The man struck thrice without being able to sever the head from the trunk. He left her bleeding, and she lived three days. Crowds came to her, and collected her blood with napkins and sponges, whilst she preached to them or prayed. At the end of that period she died, and was buried by Pope Urban and his deacons.